Craft fair features handmade gifts from Wyandotte County – Welcome to Wyandotte Daily! What’s the perfect gift? 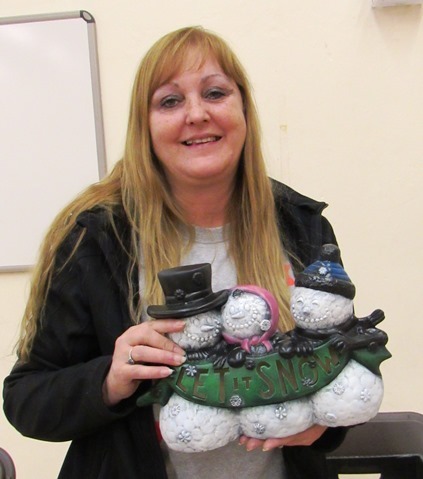 Something that is just right for the recipient, something handmade, and something from Wyandotte County? Is it something that provides you with the unusual opportunity to talk to the person who made the gift? 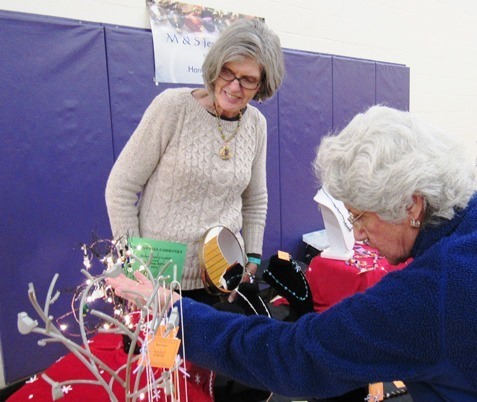 Visitors in search of the perfect gift came to the Eisenhower Craft Fair today at the Eisenhower Recreation Center in Kansas City, Kan., and found many one-of-a-kind handmade gifts from Wyandotte County and surrounding areas. Corinne Larkin had a number of ceramic figures for sale, and she said she painted every one herself. Before she retired, she worked for Michael’s and JoAnn’s for about 20 years, and she frequently bought items for crafting when they were on sale, she said. “I just needed hobbies and this was it,” Larkin remarked. “I’m now retired and this is what I do. “I enjoyed today because I met a lot of super people,” Larkin said. 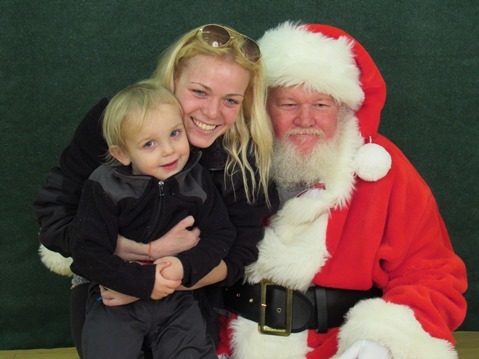 Playing Santa Claus at the event for the second straight year, Don Parish said he wanted to support this “picture with Santa” benefit for the Special Olympics. All proceeds from the photos today went to the Special Olympics, he said. Parish recalled that when one of his brothers passed away, Special Olympics contributed some funds to help with the costs of the funeral. At a table nearby, Marion Tommer of Kansas City, Kan., showed customers some of the jewelry she had made. Her handcrafted jewelry company is called M&S Jewelry Design. 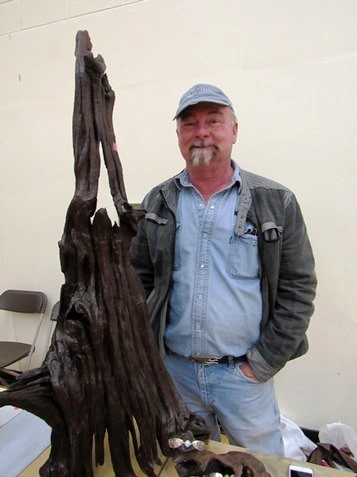 Andy Bettinger of Kansas City, Kan., displayed pieces of wood he found in or near rivers that he finishes for yard art for rock gardens. One piece in particular, he said, was cut out of a piece of cypress. “The hardest part is finding it,” Bettinger remarked. A kayaker, Bettinger has found wood from the Delaware River, the Illinois River in Oklahoma, and the Kaw River. After finding the wood, he uses a pressure washer to take off the grime and mud, then finishes it. A Parks Department employee, Bettinger started this effort this spring, and it is the first time he has ever showed it in public, he said. Also displayed at his table were antique jewelry items that his sister works on. Cheryl Vandruff of Kansas City, Kan., demonstrated for visitors the techniques used in arm knitting. 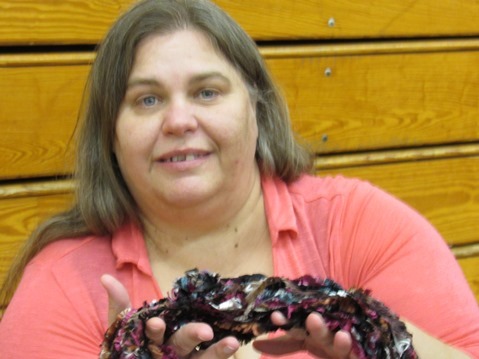 She knitted several scarves for the craft show without knitting needles, using just her arms. She found the instructions for this online, she added. Also at Vandruff’s table were several crocheted items she made, including blankets and baby bootees. 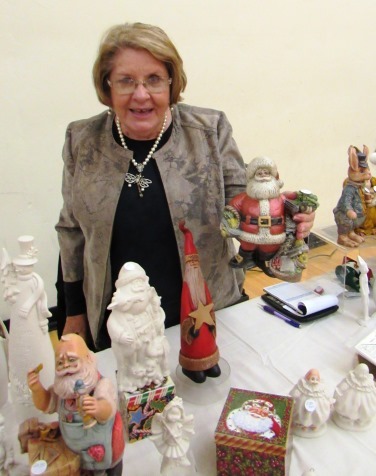 Joyce Nickell, a resident of Basehor, Kan., showed a Kansas statehood porcelain Santa she had on display. Nickell poured, fired, sanded and painted the Kansas porcelain Santa. She has extensive experience in the field, having owned her own shop in Salina for 15 years before moving to this area around 2000. She and her husband were married at St. Paul’s Church in 1960. 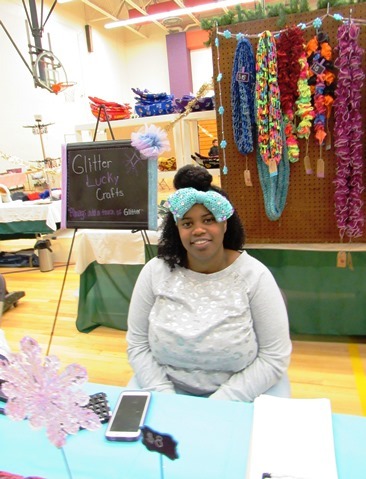 Sparkle Lucky crochets headbands, scarves, cup cozies and Christmas ornament coasters. A resident of Wyandotte County, she went to Washington High School, KCKCC-TEC and K-State. She studied event planning and is still finishing her degree. 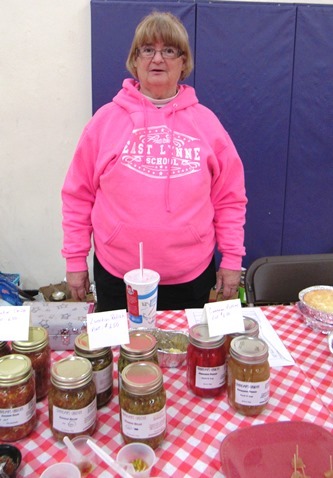 Lucky told visitors that she produced all of the items at her table in only one month. 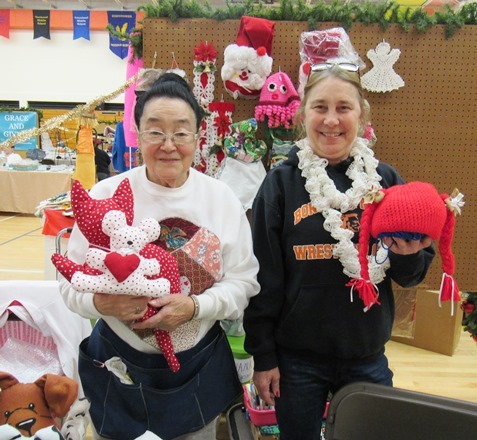 Nikki Gregory held a cat and mouse item that she sewed, and Sherrie Vogel held a pigtail hat she crocheted. 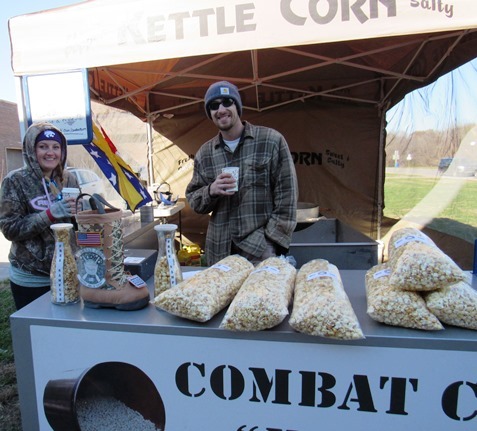 The two Wyandotte Countians have been working on crafts for many years. 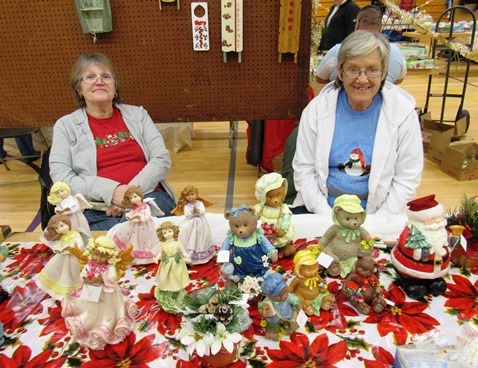 Vogel said she’s been crocheting 51 years, but this is only the second craft show for her. 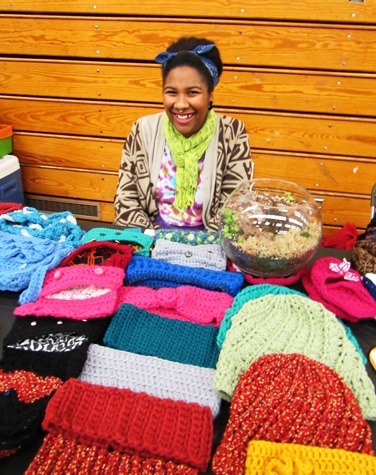 More crocheted items were offered by Lonell Brown, at a table named Friday’s Crafts. Lonell “Friday” Brown lives in Kansas City, Kan., and enjoys making crocheted headbands, hats and other items. She said she will custom-make items in various colors or sizes for customers. She also makes plant containers. “It’s my first craft show,” she shared. Juanita Clay is a former Dotte who now lives in Garden City, Mo. On her table were homemade zucchini relish, zucchini salsa and even, zucchini pie. “It tastes like apple pie,” she said. “I’m the queen of zucchini,” Clay quipped.